People with anxiety disorders are often troubled with racing thoughts. 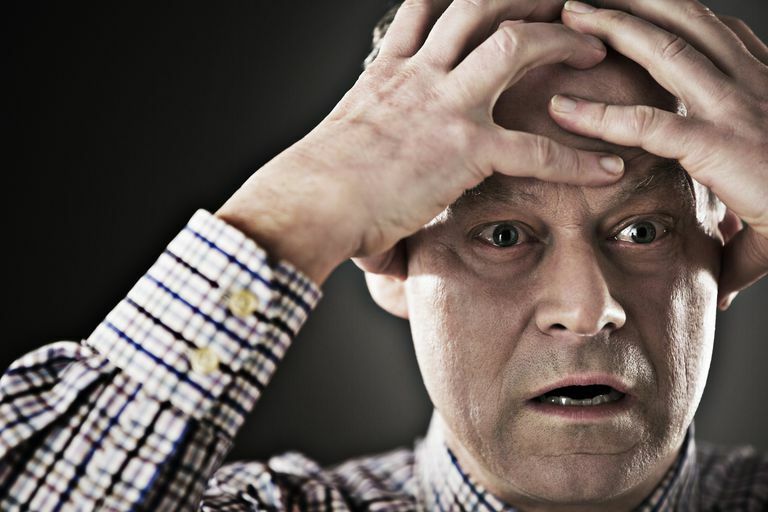 Panic disorder sufferers may find that racing thoughts are interfering with their overall well-being and functioning. Read ahead to learn more about panic disorder and racing thoughts, including tips on ways to stop racing thoughts. Racing thoughts involve quick transitioning of thoughts or thinking. Such thoughts can rapidly jump from one idea to the next, sometimes in ways that seem unconnected or illogical. Racing thoughts can feel overwhelming and out of one’s control. They can contribute to feelings of stress and anxiety, making a person feel keyed up and unable to relax. Racing thoughts can make it difficult to concentrate and complete tasks. Such fast thought patterns might even keep a person up at night, potentially contributing to sleep disorders. Racing thoughts are often associated with mood disorders, such as bipolar disorder. Such thoughts can also be linked to anxiety disorders, including panic disorder and phobias. For panic disorder sufferers, racing thoughts are often consumed by negativity, self-defeating beliefs, and worry. Medications are sometimes used to treat these symptoms, but other approaches can also be helpful. Here are some ways to deal with racing thoughts. Racing thoughts can be very difficult to manage on your own. If racing thoughts are interfering with your life, you may want to consider attending psychotherapy. Through psychotherapy, you can work with a mental health specialist to develop ways to manage your racing thoughts and other panic disorder symptoms. Your therapist may also recommend that you attend group therapy. Through group therapy, you can expect to meet with a facilitator plus other clients who are dealing with the same or similar issues. Group therapy can help you to overcome feelings of loneliness while sharing experiences and exploring coping techniques with others who can relate to your symptoms. Group therapy may also provide you with tips and techniques to get past racing thoughts. Aside from professional help, it may also be useful to have a trusted friend or family member to turn to when racing thoughts seem unbearable. Sometimes just having a person to talk with can assist you in slowing down your thoughts. Enlist a loved one to be someone you can call when racing thoughts or other symptoms take over. Think about if you have a friend or family member who is good at conversation or always seems to make you laugh. You may not even need to tell the person that you are troubled with racing thoughts. Just having a friend or family member to turn to may be all you need to keep your racing thoughts under control. Writing exercises can be a positive and proactive way to deal with your racing thoughts. All you need to get started is paper, a pen, and a little bit of your time. Try setting aside 10 minutes a day to simply write out all of your thoughts on paper. Don’t worry about grammar and spelling, just get your thoughts on paper and out of your head. Include as many details as you can, writing out all the different thoughts that have been racing through your mind. You can also use writing as a way to track your racing thoughts and progress for overcoming them. For instance, you can keep a diary to record your mood, symptoms and anxiety levels, also marking down how frequently you experienced racing thoughts each day. Additionally, you may want to track your panic attacks and other anxiety symptoms. If practiced over time, tracking can help you uncover potential triggers and sources of stress that may be contributing to your racing thoughts. Racing thoughts can make you feel scattered and unfocused, however, it possible to use that mental energy and channel it into a hobby or other task. When racing thoughts are taking over, bring your awareness elsewhere. For example, you can try to bring your attention to a good book or flip through the pages of a favorite magazine. If you enjoy creative endeavors, activities such as painting, collage, or crafting, may help take your awareness off of your thoughts and into the artistic process. Or perhaps you have an interest in other hobbies, such as cooking, photography, or woodworking. When you participate in something that you are passionate about, you may find your energy becomes more steady and focused. When seeking out ways to refocus your energy, also consider physical exercise. Engaging in a regular exercise routine has been shown to help reduce stress levels. Exercise has also been found to decrease anxiety-related tensions felt throughout the body. You may find that exercise calms your mind and allows you to feel more in control. Exercise can come in many forms, such as going to a local gym, taking an aerobics or yoga class, or jogging in the park. Even simply taking regular walks may help you clear your head and relax your racing thoughts. Your breath can be a powerful tool in helping you feel calm and stop racing thoughts. When racing thoughts are distracting you, take control through a deep breathing exercise. Breathe in slowly through your nose, keeping your face relaxed as you fill your center with breath. Hold the breath for a moment and then gradually exhale it all out through your mouth. Keep repeating these steps, noticing how refreshing and relaxing it is to take deep breaths. Once you have deep breathing down, you may want to consider adding mindfulness meditation to your breathing exercise. This relaxation technique can assist in deeply relaxing and bringing your attention back to the present moment. While meditating, racing thoughts will occur, but through mindfulness, you can learn to accept and detach from these thoughts. Mindfulness meditation affords you the opportunity to face your racing thoughts without reacting, which can eventually allow you to break free from them.